Also serving communities of Devine, Natalia. The average cost of assisted living in Jourdanton is $2,250 per month. This is lower than the national median of $3,345. To help you with your search, browse the 17 reviews below for assisted living facilities in Jourdanton. On average, consumers rate assisted living in Jourdanton 4.3 out of 5 stars. Better rated regions include San Antonio with an average rating of 4.3 out of 5 stars. Caring.com has helped thousands of families find high-quality senior care. To speak with one of our Family Advisors about assisted living options and costs in Jourdanton, call (855) 863-8283. Jourdanton is located in south Texas, roughly 30 miles north of San Antonio. This tiny community is experiencing economic growth with the development of Eagle Shale industries nearby. A safe community with proximity to a major metro area makes Jourdanton an attractive choice for retirees. The population is slightly under 4,000, with 15 percent aged 65 and older. There are four assisted living facilities in Jourdanton to serve the needs of these seniors. In Jourdanton, as in all of Texas, assisted living facilities are regulated by the Department of Health and Human Services. Two tiers of facilities are licensed based on residents' ability to evacuate the facility with or without staff assistance in an emergency and whether nighttime supervision is necessary. The weather in Jourdanton is hot and dry, with long summers and short winters. July high temperatures average 96 degrees Fahrenheit, and January lows are around 41 degrees. Those with health conditions affected by the cold will find relief here, but seniors who are sensitive to high heat may be uncomfortable. Air quality in Jourdanton is rated a 76, which is better than the U.S. average of 58. Water quality is rated a 91, with 100 being the best. Seniors with respiroty concerns may find them alleviated here. The cost of living in Jourdanton is 87.9, compared to a U.S. average of 100. The main difference is housing prices, which are 50 percent lower than the national average. This may make assisted living more affordable for those on a budget. Healthcare costs are nearly 20 percent higher, while grocery costs are slightly lower than the national average. The overall crime rate of Jourdanton is lower than the national average. Violent crime rates are less than half the nation's average, while property crime is about a third less. Texas has no state income tax, meaning that retirement income and Social Security benefits are not subject to taxation. This means more money available for assisted living expenses. However, Texas has some of the highest rates in the nation for sales tax and property taxes. The Jourdanton area is home to world-class medical facilities, including Methodist Hospital South, in the event of medical emergencies or illness. Assisted Living costs in Jourdanton start around $2,250 per month on average, while the nationwide average cost of assisted living is $4,000 per month, according to the latest figures from Genworth’s Cost of Care Survey. It’s important to note that assisted living rates in Jourdanton and the surrounding suburbs can vary widely based on factors such as location, the level of care needed, apartment size and the types of amenities offered at each community. 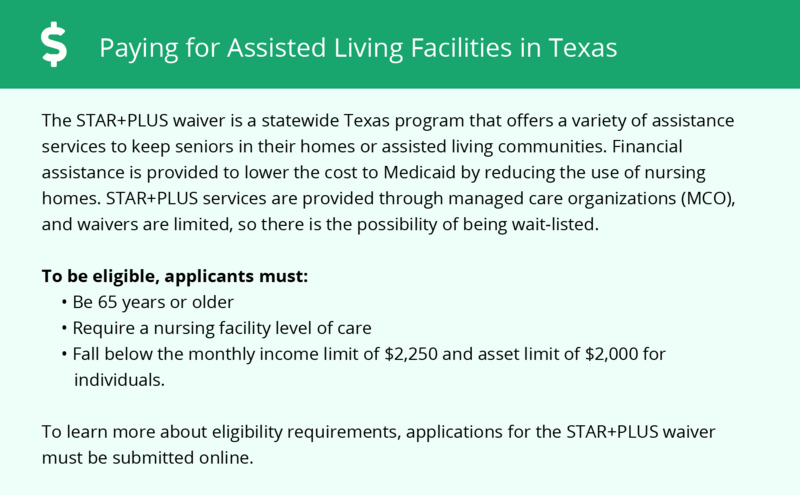 The Texas Department of Health and Human Services may be able to place seniors into assisted living communities according to their budget and level of care needed. 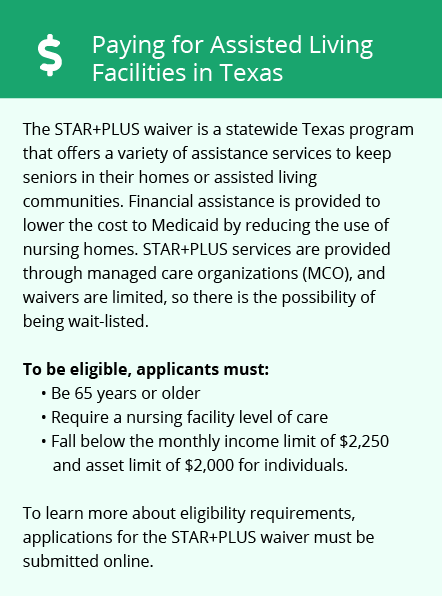 The STAR+PLUS program is also an option for qualifying seniors, those receiving Medicaid or Medicare benefits or SSI income. The program may not be available in all areas of the state. Jourdanton and the surrounding area are home to numerous government agencies and non-profit organizations offering help for seniors searching for or currently residing in an assisted living community. These organizations can also provide assistance in a number of other eldercare services such as geriatric care management, elder law advice, estate planning, finding home care and health and wellness programs. To see a list of free assisted living resources in Jourdanton, please visit our Assisted Living in Texas page. Jourdanton-area assisted living communities must adhere to the comprehensive set of state laws and regulations that all assisted living communities in Texas are required to follow. Visit our Assisted Living in Texas page for more information about these laws.